Well, let's start with Venezuela. Venezuela, population 30 million, has the third largest economy in Latin America, behind Brazil and Mexico, and recently surpassing Argentina, is also the de facto leader of a group of socialist leaning nations on the continent. 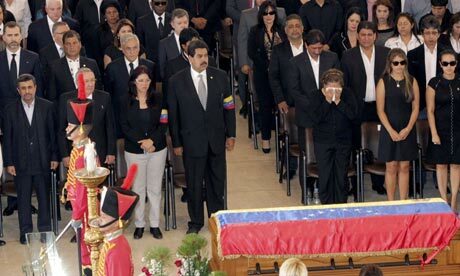 Its president Hugo Chavez died last week after a long struggle with cancer, mainly treated in Cuba. As a Blomberg news article, noted "Chavez was unable to return to Caracas from Havana for a swearing-in ceremony to start his third six-year term on Jan. 10  after winning about 55 percent of the vote over Henrique Capriles Radonski in October..."
Where does the country go from here - is there a succession plan? Yes, the constitution calls for the Speaker of the National Assembly to fulfill the duties of the office if the president is unable to assume office. And once that occurs, a new national election should take place in 30 days of the change of leadership. The trouble is, Chavez's Vice President Nicolas Maduro has declared himself President after Chavez's death, and the Supreme Court, "packed with Chavez loyalists" agreed. Diosdado Cabello, the current Speaker of the National Assembly, a Chavez supporter but also a rival with Maduro, has backed off, but the process is not being followed. Shown here with the late Hugo Chavez, the obsequious Muduro is now the top man in Venezuela. The Guardian coverage continues, "Disquiet has grown over the decision. Chávez expressed a desire to be buried in the plains of his youth, far from the capital. On Friday local media unearthed a clip of the president denouncing the practice of preserving and displaying cadavers in 2009. He made the comments in protest when Bodies Revealed, a travelling art and science show of dissected cadavers, visited Caracas. He closed it, citing moral concerns. "We are in the midst of something macabre," he said." And the actual opposition? (For what we've discussed so far is all within the factions of Chavez supporters). The October presidential candidate who lost, Henrique Capriles, upped the ante Friday, stating, ""Do you really need to abuse power to run for election?" he said at a press conference. Taunting the new president in an eerie echo of Chávez's own rhetorical style, Capriles added: "The people didn't vote for you, kid." and referring to the Supreme Court acceptance of Muduro's ascendency, Capriles denounced that ruling and called the inauguration spurious. "What the supreme court did I've qualified as an electoral fraud." Capriles, stating an obvious, but perilous observation. This blog post was about Venezuela after Chavez. But in case you are looking for a summary article on the Chavez legacy, try this one: http://www.businessweek.com/articles/2013-03-05/hugo-chavez-rip-he-empowered-the-poor-and-gutted-venezuela Now, onward to another election in Kenya. Kenya, population 41 million, and East Africa's largest economy, held its 2013 presidential election last Monday. On Friday, after days of delays, Uhuru Kenyatta, 51,(son of Jomo Kenyatta, the first President of Kenya as an independent nation) won the office with a razor thin margin of 50.07%. By obtaining over 50% of the vote, he avoids a runoff with the next highest vote gatherer, Raila Odinga, 68, who happens to be the current Prime Minister. The complications of the story is that these two also were the two top candidates in Kenya's 2007 elections, which ended with massive voting fraud (or irregularities) and significant violence along tribal and political lines that ultimately resulted in respected world leaders flying in to help calm the situation. (The position of Prime Minister itself was created in political negotiations after the 2007 election in order for Odinga to assume a leadership role in the nation and thus calm tensions.) Uhuru Kenyatta was subsequently indicted by an International Criminal Court with crimes against humanity, charged with inciting 2007-election violence. Kenyatta (left) and Odinga (right) both have been vocal in promoting a peaceful election this time. To the nation's credit this time, citizens have overwhelmingly expressed their desire for peaceful elections, as have the candidates. And so far, so good. While Odinga has said he will challenge the results - which do have plenty of instances of alleged irregularities in voting counting, secure transport, etc - all leaders are still talking of avoiding violence. Still, to have an indicted individual become president, places Mr. Kenyatta in a rarified and dubious circle. Just two countries have their leaders under indictment for war crimes - the other being the notorious Omar al-Bashir, President of Sudan. Western governments are in a bit of a pickle. The UK policy is to avoid contact with anyone indicted by the ICC, and most push hard and sincerely for open, fair elections with the outcomes being wild cards. (Reference Egypt...). This outcome is an example of another wild card - how do countries do diplomacy with Kenya now? No conclusions, just that Kenya's election has complications, but congratulations to date for respecting the rule of law, including the bizzare situation of Kenyatta now having to go to trial in The Hague, Netherlands, while governing his East African homeland. A followup article on the spectacle of Kenya's new President due in court next week to answer to charges of "crimes against humanity." From the BBC (http://www.bbc.co.uk/news/world-africa-21742410) we read that the same charges against another individual have been dismissed, but not against Uhuru Kenyatta, and not against his new Vice President - William Ruto - also facing the charge.